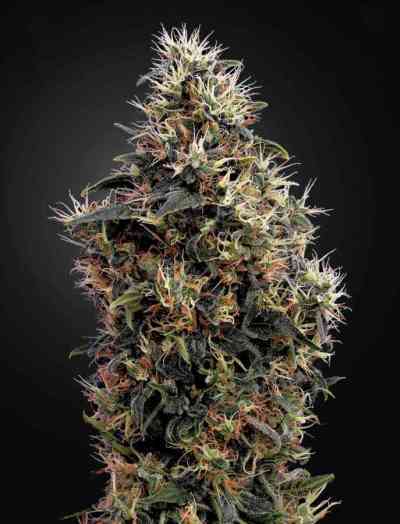 Haze XXL Auto cannabis seeds by Dinafem Seeds belong to a feminized autoflowering Sativa-dominant cannabis strain that results from the cross between a Jack Herer and a Haze 2.0 Autoflowering. It is a high-quality marijuana seed that provides Haze lovers with fast abundant crops. Haze XXL Auto cannabis seed was born to meet the expectations of the numerous fans of this unique strain. It is an outstanding fast-flowering easy-to-grow vigorous medium-sized/big marijuana plant that yields elongated resinous buds. It shows great stability, probably due to the fact that it has been backcrossed with the same mother for three generations. Offering good results without complications both indoors and outdoors, this cannabis seed is suitable for growers of all levels. It is advisable to add 30% of coco to the soil and to water frequently but in small amounts. Ideally, it should be grown outdoors from mid-May on to make the most of the light intensity and the optimum photoperiod of the season. Haze XXL Auto has a deep flavour and aroma, with clear notes of incense, pine, lemon and exotic woods. The long-lasting effect is powerful and cerebral. It is the perfect cannabis strain for several activities with your friends.